What is it about cookie dough that is just so addicting? It is pretty much impossible for me to make chocolate chip cookies without eating at least a little bit of dough. The great thing about this Chocolate Chip Cookie Dough Fudge that I saw over at Buns In My Oven is that you can eat as much as you please because it doesn’t contain any uncooked egg. Jackpot!! I think that really is the only thing holding me back from consuming an entire batch of cookies before they are made sometimes. 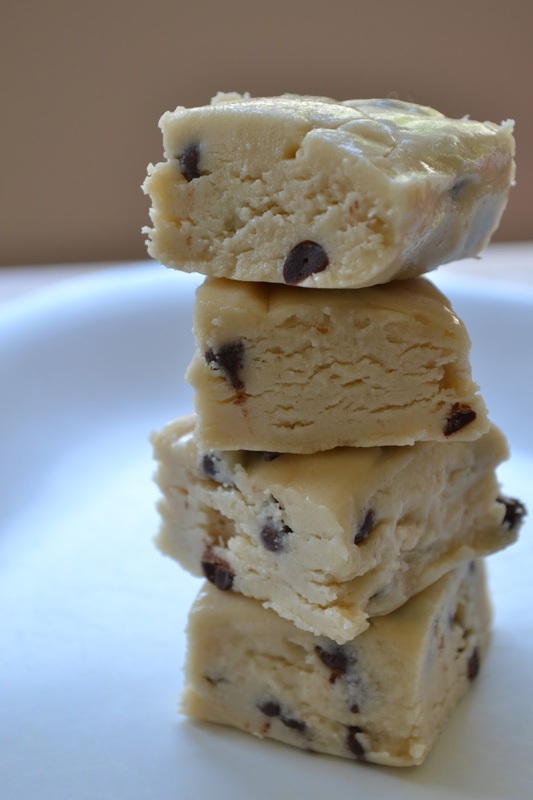 This fudge is delicious and would make such a great gift to give around the holidays or just for anyone you know that loves their chocolate chip cookie dough as much as me! It is relatively easy to make but it does require a few hours of chilling time in the fridge before you can enjoy it, which is the only downside. 1. Line an 8×8 in baking dish with tin foil, leaving a little bit of an overhang and spray with cooking spray. 2. To make the cookie dough, in a medium bowl, beat together the butter and sugars until light and fluffy. This will take several minutes. Beat in the vanilla, salt, and half and half. Then, stir in the flour until incorporated and set aside. 3. To make the base for the fudge, combine the brown sugar, butter, salt and half and half in a saucepan and stir over medium-low heat until the butter has melted and the sugar is dissolved. Remove from the heat and slowly stir in the powdered sugar, 1 cup at a time. Stir until the mixture is smooth, then add in the vanilla and stir to combine. 4. Add the cookie dough to the fudge base and stir to combine. Gently fold in the chocolate chips. Spread the mixture into the prepared baking dish and chill for at least 3 hours until set. 5. Pull out using the overhang and cut into squares. Store for up to 1 week in the fridge.